The health of your child’s teeth and mouth is very important to the well-being of their entire body, and while routine brushing and flossing at home is necessary to keep your child’s smile looking its best, visiting the dentist for a comprehensive exam and cleaning is essential. The American Dental Association recommends that your child visit the dentist every six months to ensure his or her teeth stay healthy and smile stays beautiful. During your child’s exam, Dr. Ledenyi will thoroughly examine your child’s teeth and gums for signs of tooth decay, gum disease, and other health problems. He will explore the surfaces of your child's teeth to determine if there are any cavities and to examine the quality of existing fillings. Depending on the exam, Dr. Ledenyi may also prescribe X-rays to see what is happening beneath the surface of the teeth and gums. These images will help the Dr. Ledenyi discover dental issues not visible to the naked eye. Cleanings should be worry and pain-free, but if your child has any anxiety, be sure to let the us know before we get started. Dr. Ledenyi has several options to ensure your child’s comfort. Dr. Ledenyi will carefully clean your child’s teeth with a variety of tools to remove any debris, plaque or hard mineral buildup (tartar) from the teeth. Then, either Dr. Ledenyi or one of our pediatric dental assistants will floss your child’s teeth, use a polishing compound, and if Dr. Ledenyi prescribes it, apply fluoride. Only after a thorough history, exam and Caries (cavities) Risk Assessment will Dr. Ledenyi make recommendations regarding fluoride. 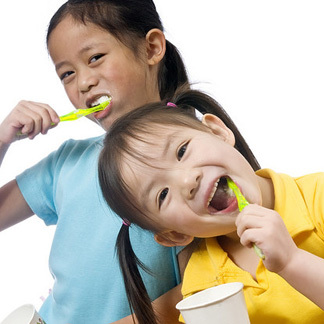 Our pediatric dental team may also discuss additonal or alternative options to improve your child's dental health, like xylitol or ultra-sonic toothbrushes. If Dr. Ledenyi finds tooth decay or gum disease, we will talk with you about changing your child’s brushing or flossing habits. In severe cases, Dr. Ledenyi may recommend antibiotics or other dental treatments. If your child’s teeth and gums appear to be healthy, Dr. Ledenyi will probably recommend that your child continue his or her brushing and flossing routine as usual.